If you are an experienced trainer, an instructional designer, a specialist in performance improvement, or a manager responsible for learning and performance, Performance-Based Evaluation . . . offers you the proven tools and information to evaluate programs and people performance. Filled with real-world examples, this practical resource will help you to determine what to do and (just as important) what not to do. In addition, the book includes a CD-ROM with customizable and reproducible job aids, charts, and exercises. Judith Hale is the president of Hale Associates, a consulting firm specializing in performance management, performance improvement systems, and strategic planning. She has contributed to or edited many published works, including The Performance Consultant's Fieldbook (1998) and Performance-Based Certification (1999), Designing Work Groups, Jobs, and Work Flow (1995) and Designing Cross-Functional Business Processes (1995), all published by Jossey-Bass. 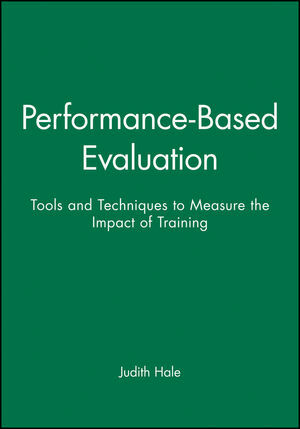 She is a contributing author to The Guidebook for Performance Improvement (Jossey-Bass/Pfeiffer, 1997). The recipient of several professional awards and honors, Hale is past-president of the International Society for Performance Improvement (ISPI) and an active member of ASTD. List of Exhibits, Tables, and Figures. Chapter 1: Evaluation as a Strategy. Vendors, Contractors, and Off-the-Shelf Programs. Chapter 2: Why Measure Effectiveness and Efficiency. Chapter 3: How to Measure Effectiveness. Chapter 4: How to Measure Efficiency. How to Find Internal Measures. Chapter 5: How to Measure Hard and Soft Skills. Chapter 6: How to Measure Required and Mandated Programs. Proficiency and the Role of Training. Chapter 7: How to Measure Elective Training and Employee Relations Programs. Management Sponsored or Championed Programs. Programs Based on a Perceived Need. Measuring Probability of Adoption and Long-Term Change. Chapter 8: How to Evaluate Delivery Alternatives. Chapter 9: How to Sample People and Documents. Chapter 10: How to Collect Data. Chapter 11: How to Analyze Data Using Descriptive Statistics. Chapter 12: How to Analyze Data Using Inferential Statistics. How to Use the CD-ROM.